Both albums that constitute this ‘2 for 1’ single CD reissue, respectively they date from 1975 and 1976, were produced by David Anderle who had worked from the outset on the recordings made by this Springfield, Missouri based sextet. On “The Car Over The Lake Album” the band was blessed by the presence of four ‘in-house’ songwriters [all original band members], namely John Dillon, Larry Lee, Steve Cash and Randle Chowning, although the latter party had departed, to launch his solo recording career, by the time “Men From Earth” was issued. Chowning’s place in the band was filled by Norwegian born Rune Walle [guitars, mandolin, sitar]. 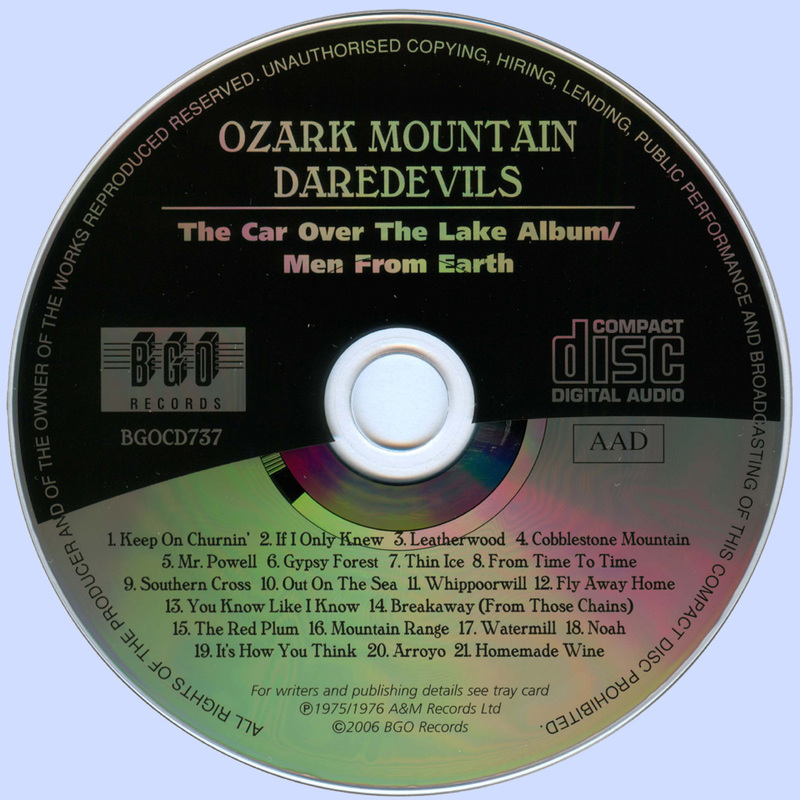 U.K. based BGO Records issued the band’s debut and sophomore recordings, respectively “The Ozark Mountain Daredevils”  and “It’ll Shine When It Shines” , as a ‘2 for 1’ CD package during January 2005. The latter pairing, co-produced by Glyn Johns and David Anderle, each yielded one U.S. Pop Chart hit single - the only major commercial success the Ozarks were to enjoy. “If You Want To Get To Heaven” made the lower reaches of the Top 30, while the subsequent “Jackie Blue” achieved the heady # 3 position. 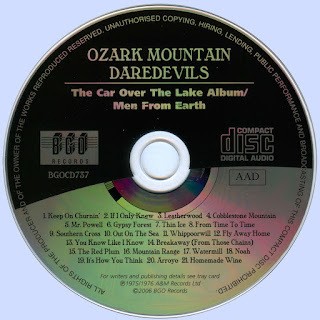 Having mentioned the quartet of songwriters in the band, a non-band member contributed to one cut on “The Car Over The Lake Album.” Minnesota bred hit country songwriter Elizabeth Anderson [Lynn Anderson’s mother] co-penned the penultimate cut “Out On The Sea” with Dillon. Following the appearance midway through 1968 of the Byrds country collection “Sweetheart Of The Rodeo,” a rash of long-haired country-rock influenced combos were formed during the ensuing years. Prior to working with OMD, music history records that Glyn Johns produced The Eagles’ 1972 self-titled debut album and their sophomore ‘thematic’ release “Desperado” . As might be inferred from the song title, Dillon’s “Keep On Churnin’” is a frantic paced number and it kicks off the “Car” collection replete with a rowdy rock ’n’ roll guitar riff. The considerably slower Lee/Cash soft-pop sounding collaboration “If I Only Knew” scored the band a Top 50 U.S. Pop single, and it’s followed by Chowning’s “Leatherwood” a ‘take it easy in the backwoods’ themed number. 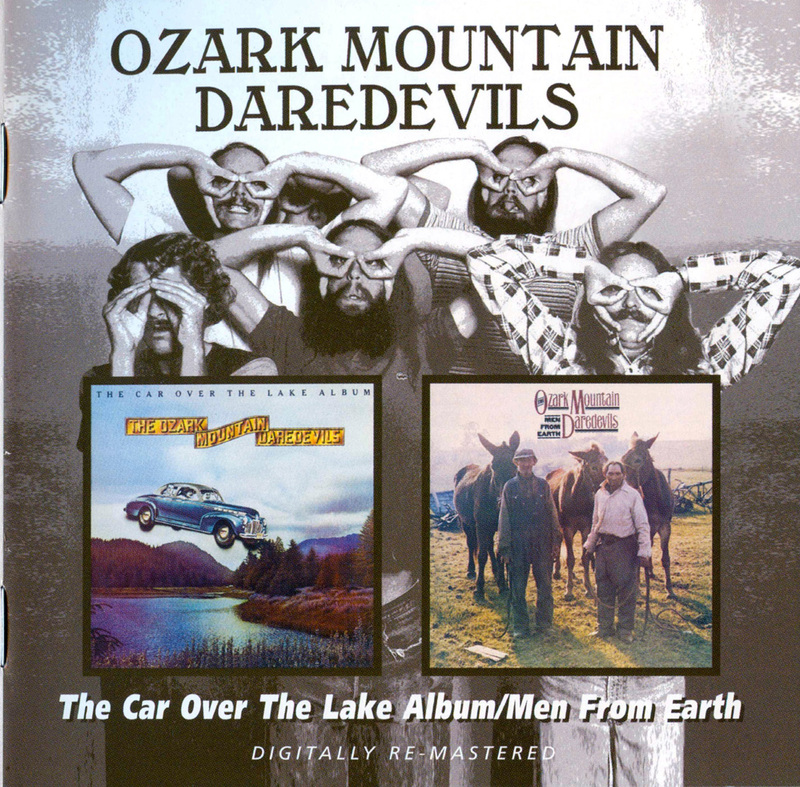 The latter is the first truly country sounding cut on “The Car…” In truth there are only a handful of “Car” and “Men” tunes that truly satisfy the country formula. The lyric to Cash’s “Cobblestone Mountain” [also] possesses a backwoods feel, while Lee’s “Mr. Powell” is a vocal harmony rich cut, as is the later Lee/Dillon collaboration “From Time To Time.” Featuring another backwoods themed lyric, Chowning and Cash were responsible for the hoedown paced “Gypsy Forest,” although sadly it’s followed by their uninspired love song “Thin Ice” – the repeated “We’re travelling on thin ice baby” pretty much reveals the total content of this three minute long cut. “Southern Cross” is simply riff rock filler, while Chowning’s gentle sounding “Whippoorwill” closes the Ozarks third album. The twenty-page liner booklet that accompanies this release contains a short history of the band by journalist/writer John Tobler, and also features the lyrics to all the songs.